DAY 1: Srinagar Airport to sonmarg: Our services start with your arrival at Srinagar Airport. Meet & greet and transfer by Car to Sonmarg. Arrive Sonmarg & check in your booked Hotel / Swiss Camps. Rest of the day at leisure. Dinner & Overnight stay at Sonmarg. 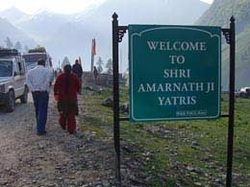 Day 2: Baltal to Holy Amarnath Cave to Srinagar: After early breakfast short drive of 15 Kms will take you to Baltal (Helipad) board into the Helicopter and short ride to Amarnath Ji. Day for Amarnath ji Darshan and board again into the Helicopter and reach Baltal. Return back to Srinagar. Dinner & Overnight at Houseboat/ Hotel. Day 3: Srinagar to Mughal Gardens: Visit famous Mughal Gardens (Nishat, Shalimar Cheshma Shahi) & Shankaracharaya Temple) & Old and New Srinagar city, overnight stay at Houseboat/Hotel. Day 4: Srinagar to Gulmarg: Day trip to Gulmarg. Full day at leisure to take the leisurely walks on the lush green meadows of flowers with a backdrop of the snow-capped mountains. Enjoy pony ride or Gondola ride (rope way) to Khillanmarg at your own cost, evening back to Srinagar at Houseboat. Day 5: Srinagar to Pahalgam: Today you will be transferred by road to Pahalgam (94 kms/2.5 hrs) Valley of Shepherds. You will have a rare opportunity to visit the Saffron fields. Also visit Avantipura Ruins & Anantnag Sulpher Springs en-rooted Enjoy the bounty of Nature at Pahalgam, located on the bank of beautiful Lidder River, Return to Srinagar, and Overnight in the Houseboat. Day 6: Departure: As per flight timing, transfer to Srinagar Airport tour ends. 04 Nights’ accommodation at Srinagar in Houseboat. 01 Night in Sonamarg in Hotel/Tent. Parking charges/ Road Tax/ Driver allowances with overnight halt as per the above itineraries. Baltal Helipad - Panchtarni - Helipad & Baltal Helicopter Ride.